The Rencontres R will take place in Bordeaux on the Victoire campus of the Bordeaux Segalen University. You can download a map of the campus on which the different conference rooms of the Rencontres R are indicated. Bordeaux has a network of tramways and buses to move around. For more information, you can visit the website of the city public transport . If you prefer a taxi, you can estimate the cost and time of your trip with bordeauxtaxi.com. By plane. You will land at the airport of Bordeaux-Merignac. Instead of taxis, to get on campus you can choose the Jet'Bus and get off at the "Office du tourisme" stop. 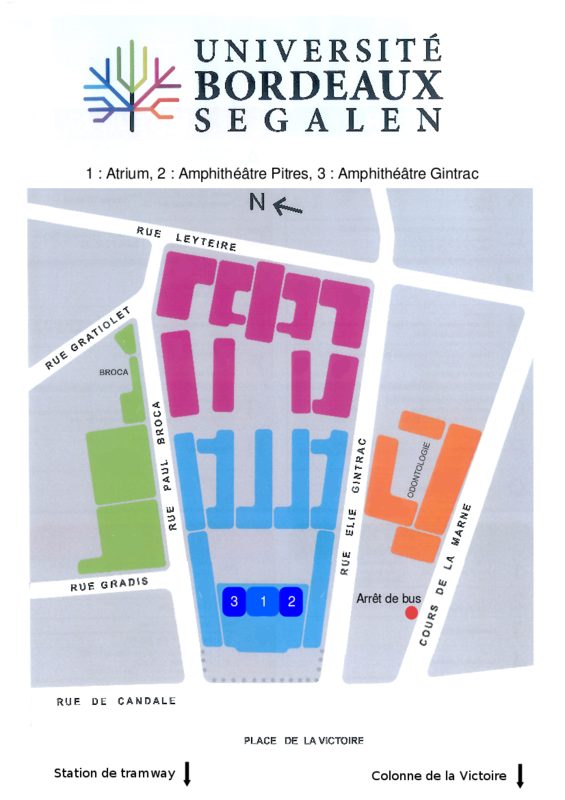 Then you can take tram B direction "Pessac Centre" to "Victory" stop, not far from the campus. It is also possible to choose other transportation routes through bus 1 which connect the airport to Bordeaux downtown. From the A10 (Paris, Rennes, Lille). Take the ring road direction "Toulouse / Bayonne" to exit 26. Then follow the same route as that from the N89. From the A62 or A63 (Toulouse, Marseille, Pau, Bayonne). Take the ring road direction "Paris / Bordeaux" to exit E72. Continue on the A631 and then on the Quai Sainte-Croix, still following the city center direction. Turn right, direction "Lormont / Cenon / center", then immediately left, direction "porte de Bourgogne". From the N89 (Lyon, Genève). Follow Bordeaux, straight along Kennedy Avenue. Continue straight through Cenon and cross the "pont de pierre". Pass the "porte de Bourgogne", towards the city center. Anyway, from the "porte de Bourgogne", you have to turn left at the eighth traffic light, towards the "Place de la Victoire". Continue along the tramway up to that place where you can find a charged parking area. The website of the Bordeaux tourist office offers two tools to find accomodation solutions and restaurants. These allow you to choose services close to the location of the Rencontres R with the field "Location" that you can set to "Victoire". In Bordeaux, you can find plenty of historical monuments, parks, gardens and cultural events. These are described briefly on the city website. In the region, the Bay of Arcachon and Saint-Emilion village are remarkable places of interest.